Efforts to build an alliance between faculty and students aren’t new. As Hess points out, the two first came together four years ago in a campaign aimed at winning more state funding for UMass. But the partnership really found its footing in the campus-wide fight over a proposed parking fee hike back in 2013. Soon after UMass administrators announced the plan to hike fees, campus unions and other groups formed the coalition known as STOP: Stand Together, Oppose the Parking Fee Increase! The coalition showed its strength in dramatic fashion when student, staff and faculty protesters lined up across campus to deliver petitions with more than 5,000 signatures to the Chancellor’s office. The message: faculty, staff and students were united in opposition to a plan that would have fallen most heavily on students and the lowest paid employees on campus. The alliance that formed around the parking issue, notes Hess, constituted a major step forward. 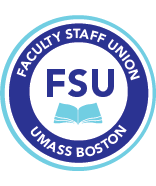 “For the first time, students were allowed to participate in bargaining, which is in our interest and theirs.” Now faculty and student representatives are hoping to use what has become a real partnership to push back on an administration bent on shifting costs onto students, and to lay out an alternate vision for funding public education. At the Board of Trustees meeting, FSU President and economics faculty Marlene Kim joined leaders of the Professional Staff Union and the Classified Staff Union to oppose the fee increase. “[T]he recent fee and tuition increases hurt students,” Kim told the Trustees. “I see this in my classes. One student had no heat. One had no winter shoes. Some are hungry. Many work so many hours to afford the costs of college, they don’t have the time, or they are too tired, to do their homework or write their papers. Kim noted that financial aid doesn’t always cover these increased expenses. “Not everyone qualifies for financial aid. Many students fall through the cracks: Their parents don’t pay, don’t pay enough, or can’t pay what the State says they are supposed to afford.” She told the Trustees that her own experience as a student mirrored that of too many students at UMass Boston. Kim and other union and student representatives urged the Trustees and state officials to look to alternatives to “digging an ever-deeper well of student debt,” including supporting the “Fair Share” Amendment (see here for more information) that would raise money for education and transportation by increasing taxes on millionaires in Massachusetts.